This was originally posted for the February issue of Conexion. BB was given three media passes to Seaworld for their Three Kings Celebration. Opinions and post all Babushka's. It’s Febrero and lots of y’all are thinking about Valentine’s, Dia de los Enamorados. Aunque Babushka’s been married 3 times and romanced plenty, write on that aspect? JU SO FONII!! Today we speak on something different. BB takes daily life and being grateful for it very seriously. Those of you who follow Babushka on social media know that at noon is posted #GSOG #GigaSecondOfGratitude #GospelOfGracias. This is where a quick shout out to life is shared. It could be for anything, everything. This is what is wished for you this year Beautifuls-to be grateful for life and all its' adventures. Hoy BB shares her first adventure of the year. 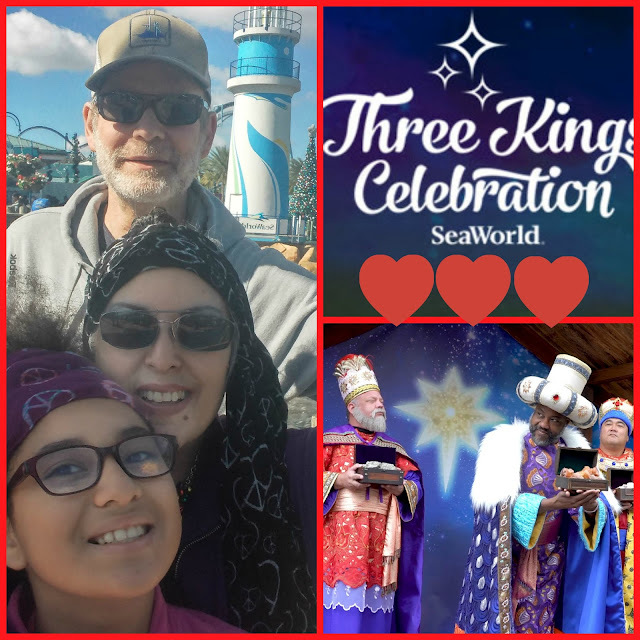 Babushka started 2019 off with a hosted visit to SeaWorld Orlando , on Three Kings Day. Reyes, celebrated by a major Florida theme park. Think about this Beautifuls. Via the US Census, Latinos in the summer of 2018 made up 25% of the states population- yet there had been no dedicated dia to us. Gracias Seaworld. BB went to the inaugural Reyes Celebration last year and wanted to see if they would repeat it. Not only was it repeated, but it was bigger. No te puedo decir how happy we were to see more of our culture shared. The foods, the musica, the beautiful sound of our language being spoken, sin pena and often. Families sharing with their little ones the story of the 3 Kings and their memories of childhood celebrations. The best part of the grand day was in the final show. The “warm up” was a latino singer/musician who spoke to the audience in Spanish and sang Christmas songs of their youth. Sin exageration, a BB se le aguaron los ojos, couldn’t help getting emotional when a giant auditorium was filled with love of their Navidades Nativos, all joining in song, memorias y longing. Being able to relive the joy and reason of the season, to share with family our ways, our culture, in GRANDE. Because we all know recognition by a major presence vale mucho in the world’s eyes, we thank you Seaworld Orlando for the festivities. Appreciation is love. And there is so much to be appreciative of. Make sure to acknowledge whatever brings you joy. Share that acknowledgement and joy wherever you can. The memory will bring you more joy, and we could all use some of that. This article shows appreciation and familia fall under that palabra. What falls under that word for you Beautifuls? P.S. Gracias to Seaworld Orlando FB Messenger for sharing the musician's info. That performance was wonderfully done by Samuel Velez. For me happiness is my family and unexpected time with my family. Like yesterday when I was able to spend the day with my sister and my niece and nephew after taking my son to breakfast. This looks like a fun time. We have a Sea World nearby that we enjoy going to. We haven't been to this celebration yet. We love Sea World. Actually, we're in Orlando now enjoying several theme parks and making memories with the grandkids. We had a blast at SeaWorld Orlando a couple of years ago. Yes, a great place for family time. I certainly have a lot to appreciate in my life as well! And I make sure to appreciate it daily! I believe that life is too short to accept anything but happiness and joy. It looks like you all had a fantastic time! Looks like you all had some fun. I haven't been to Seaworld is so long. There used to be one in Ohio, where I grew up. I have moved away and have not been since. It looks like such a great time to see Sea World. I would love to see this celebration. This sounds like so much fun. Looks like you had an amazing time on your visit. Thanks for sharing. I appreciate a lot of things in my life. But I would have to say that my family really tops that list. For me I enjoy spending time with people I care about. I haven't been to Sea World in years. We haven't been to Sea World in years. I can't wait to take my family back! Even though we've had a few big bumps in the road recently, my family certainly has a lot to be happy about. It sounds like the show was really enjoyable! What a great article to read! This show looks amazing and happy bonding with family. Love this! Oh gosh...I would love to travel to Sea World one day! How fun!! We have not been to Sea World in Orlando but hopefully someday we could. We've visited the one in San Antonio years ago and we loved it. Is it just me, or do you just ooze happiness and fun??? I don't think it matters where you go, you are going to have a good time! I do like Sea World, too, so I know this was an easy place to write about! Happy Valentine's Day! It's been so long since we've visited Sea World. Our family made so many fond memories there when the kids were small. I need to go back soon!